Now that the unofficial start of summer has come many people are turning their thoughts to the carefree fun that this season brings. This means plenty of time outdoors with your aging parent enjoying activities such as leisurely days at the beach, fun cookouts, and even high energy hikes to improve their physical health. Anytime there is activity outside, however, there is risk of sunburn and this risk increases during the summer months. The summer brings the most intense sunlight of the year and because people tend to be outside more during the summer than they are at any other time, this is when the majority of sunburns happen. Caring for those burns is an important part of reducing their uncomfortable effects and protecting your parent from negative health consequences. The best thing to do when it comes to sun safety is to avoid a sunburn all together. Sunburns dramatically increase the chances that your parent will experience skin cancer and can lead to many health complications, including dehydration, infections, and skin scarring. If you are not able to completely avoid a sunburn, however, responding promptly and effectively can help you to control the negative effects and protect your parent from further problems. Cool the burn. Even when your parent gets out of the sun the skin can continue to burn. This is because the burn can go down into the deeper layers of skin and continue the damage. This is why it is important to cool off the burned area as quickly as possible. This will help to stop the burn and reduce the need for the body to send water to the area to cool the skin. Rinse the skin in cool water or apply a cool compact. Never rinse with cold water or place ice directly on the skin as this could cause serious skin damage. Replenish the moisture. Sunburns are extremely drying. This can lead to serious discomfort, skin damage, and the potential for irritation and infection. Help to keep this from happening by applying a high quality, non-water based moisturizer frequently. The best time to apply this moisturizer is after a bath or shower. Pat the skin dry carefully but allow it to remain damp and then apply the moisturizer so that it holds that water to the skin. Rehydrate. A sunburn causes serious disruptions to all areas of the body, not just the skin. One of the most serious is dehydration. The body will pull water from all systems of the body to try to cool and heal the skin, leaving the rest of the body suffering serious consequences. Encourage your parent to drink plenty of fluids for the days after the burn to rehydrate the body and help the skin to heal. A senior care provider can be extremely beneficial during the summer months. This care provider can not only help your parent to enjoy safe and healthy warm weather activities, but can be instrumental in encouraging them to protect themselves from the sun and caring for themselves after a serious burn. 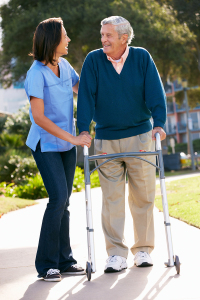 For in-home Senior Care in Oakland TN, please contact the caring staff at Personal Care Services MidSouth today! This entry was posted in Senior Care Oakland TN and tagged Senior Care Oakland TN. Bookmark the permalink.